Sébastien Olivier Bourdais (born 28 February 1979) is a French professional racing driver, who resides in St. Petersburg, Florida. He is one of the most successful drivers in the history of American Championship car racing, having won 37 races. He won four successive championships under Champ Car World Series sanction from 2004 to 2007. As of March 2017[update] he had won 75 races. He drove in Formula One for the Toro Rosso team during 2008, and the start of the 2009 season, but was unable to translate his past successes to that competition. As of January 2018[update], Bourdais drives for Dale Coyne Racing with Vasser Sullivan in the Verizon IndyCar Series, and for Ford Chip Ganassi Racing as a third driver in the WeatherTech SportsCar Championship and 24 Hours of Le Mans. Following his success in the lower formulae, Bourdais joined the Prost Junior Team in the International F3000 Championship. He finished ninth in the series with one pole and a best finish of second. In 2001, Bourdais moved to the DAMS team in Formula 3000 and took his first win in the series at Silverstone. He changed teams again for 2002, taking his Super Nova Racing car to three victories and seven pole positions. He beat Giorgio Pantano to the championship by two points after Tomáš Enge, who had scored the most points, was penalised for failing a drug test. In 2002, Bourdais got his first F1 test with the Arrows team and was signed on to drive for the team but the team was on the verge of bankruptcy. In December he tested for Renault at Jerez but fellow Frenchman Franck Montagny secured the test drive instead of Bourdais. Bourdais returned to F1 in 2007 after being given several tests with Scuderia Toro Rosso. On 10 August 2007 it was announced Bourdais would replace Vitantonio Liuzzi at Red Bull's b-team, Toro Rosso, as team-mate to Sebastian Vettel. On 16 March 2008 Bourdais competed in his first Formula One Championship race, the 2008 Australian Grand Prix in Melbourne. After qualifying in 17th position he took advantage of mistakes made by other drivers, in the first Formula One race since the 2001 San Marino Grand Prix without traction control, and worked his way up to fourth. However, with three laps remaining an engine problem forced Bourdais to retire, but he was still classified 8th having completed more than 90% of the race distance. He later inherited seventh place (and two Championship points) after the disqualification of Rubens Barrichello. Bourdais qualified in fourth place for the 2008 Italian Grand Prix. However, his car would not select first gear on the grid and had to start from the pit lane, a lap down (as the race started behind the safety car, there was no warm-up lap). Although he eventually finished a lap behind the race winner, team-mate Vettel, he set the second fastest lap of the race; only Ferrari's Kimi Räikkönen went faster. At the 2008 Japanese Grand Prix he was 6th on the road, but received a 25-second penalty for causing an avoidable accident with Felipe Massa dropping him to 10th. Few agreed with the decision – ITV Sport's Martin Brundle had stated during live TV coverage of the race that he felt Massa might receive a penalty, whilst his colleague James Allen stated that 99% of experts he spoke to felt that Bourdais did not deserve a penalty; the FIA were under such public scrutiny at the time following a string of controversial decisions that they made the unprecedented step of releasing publicly "stewards only" footage of the incident, to justify the decision. Bourdais tested significantly for the Toro Rosso team during the winter, though he was uncertain of a drive heading into the new year. On 6 February 2009 however he was confirmed as a Toro Rosso driver for a second year, partnering Swiss rookie Sébastien Buemi. Despite two points finishes in the year at the Australian Grand Prix and in Monaco, Bourdais struggled to match his less experienced team-mate. In Spain Bourdais struck Buemi's car as the field attempted to avoid a spun Jarno Trulli on the first lap, ending the race for both drivers. At the British Grand Prix Bourdais collided with McLaren driver Heikki Kovalainen, again ending the race for both. At the German Grand Prix he suffered a mechanical failure after qualifying last by over a second. On 16 July 2009, Toro Rosso announced that Bourdais would no longer be driving for the team. Toro Rosso's Franz Tost said the partnership had not met up to his expectations, and Bourdais would be replaced as of the Hungarian Grand Prix. Bourdais was advised by counsel to file suit for breach of contract by Toro Rosso, as he had a viable case. Toro Rosso settled the matter with a $2.1 million payment Bourdais to avoid litigation. He returned in 2000, finishing fourth with Emmanuel Clérico and Olivier Grouillard for the Pescarolo team behind the three dominant Audis. His next three appearances did not go so well. He shared a Courage C60 with Jean-Christophe Boullion and Laurent Rédon in 2001 but it retired after 271 laps. He drove the same model the next year and finished ninth in the LMP900 class with Bouillon and Franck Lagorce. He missed the 2003 race and returned in 2004, only for the car he shared with Nicolas Minassian and Emmanuel Collard to retire after 282 laps. 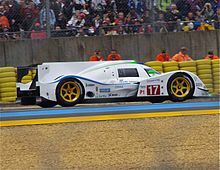 Bourdais' next assault on Le Mans would come at the wheel of a factory-backed Peugeot 908 HDi FAP in 2007. The car he shared with Stéphane Sarrazin and Pedro Lamy finished the race second behind the winning Audi R10 TDi, despite an embarrassing slide on the first lap in wet conditions that cost Bourdais a place to one of the Audis, and car problems forcing him to park the car for the last minutes of the race, waiting for the lead R10 to cross the line. In his second Le Mans as part of the Peugeot factory team, in 2009, he finished in second place, one lap behind the winning Peugeot. Bourdais was to drive the pole-winning No. 3 Peugeot in 2010, but a suspension failure halted co-driver Pedro Lamy before Bourdais could turn one lap in the race. While racing in the junior formulae and Champ Cars, Bourdais made several appearances in other championships. He won the Spa 24 Hours in 2002 with Christophe Bouchut, David Terrien and Vincent Vosse in a Larbre Compétition Chrysler Viper GTS-R. He also won his class at the 2006 12 Hours of Sebring in a Panoz Esperante. In 2005 he also competed in the International Race of Champions, winning his first stock car race at Texas Motor Speedway. In 2009, he set the official lap record at Sebring International Raceway, during the 12 Hours of Sebring. In 2010, Bourdais raced with Scott Tucker, Christophe Bouchut, Emmanuel Collard and Sascha Maassen for Crown Royal in a Level 5 Motorsports prepared Daytona Prototype in the prestigious Rolex 24 at Daytona, held at Daytona International Speedway in Florida. Bourdais recorded incredibly fast laps before the car retired due to an engine failure with Collard at the wheel. In October 2010, Bourdais drove with Jonathon Webb in the Mother Racing Ford Falcon V8 Supercar in the Gold Coast 600. In October 2011, Bourdais drove with Jamie Whincup in the Team Vodafone Holden Commodore V8 Supercar in the Gold Coast 600, winning Saturday's opening race and finishing second in the second race landed Bourdais the inaugural Dan Wheldon Memorial Trophy, awarded to the international driver who scored the most points over the Gold Coast weekend. Wheldon had been set to contest the event but lost his life in the 2011 IndyCar season finale just a week earlier. Winning the V8 Supercar race meant that he is the only driver to have won a race at the Surfers Paradise Street Circuit in both Champcar/Indycar, as well as V8 Supercar. He has also participated in the Bathurst 1000 once, finishing ninth with Lee Holdsworth in 2015. On 20 May 2017, Bourdais was involved in a single-car accident while qualifying for the Indianapolis 500. He suffered multiple fractures to his pelvis and a fracture to his right hip. The surgery was successful but Bourdais was forced to sit out for most of the season to recover. Bourdais would return at Gateway and run the final three races of the season. In 2018, Bourdais returned to the Dale Coyne Racing Team now partnered with investors James "Sulli" Sullivan and former driver Jimmy Vasser as Dale Coyne Racing with Vasser Sullivan. The team also found steady sponsorship in the form of SealMaster, and SportClips Haircuts. Bourdais started The Firestone St. Petersburg Grand Prix in 14th place. He ended up losing a tire on the opening lap but the misfortunes of Will Power and Tony Kanaan saved him from going a lap down. He went on a off sequence pit strategy and found himself 3rd with a handful of laps to go. On the final restart, Alexander Rossi divebombed the first corner and got his tires locked up on the slick airport runway paint and got into race leader Robert Wickens who had led 67 laps that day and Bourdais snuck by to win. It was his first win since last year at St. Petersburg and his first since the injury. Bourdais was emotional in victory lane and said "he never doubted that he would run in IndyCar again". Bourdais went on to win pole at the very next race in Phoenix, his first on an oval since 2006. Bourdais was also the only driver to lead laps at each of the first four races of the 2018 Verizon IndyCar Series season. This page is based on the Wikipedia article Sébastien Bourdais; it is used under the Creative Commons Attribution-ShareAlike 3.0 Unported License (CC-BY-SA). You may redistribute it, verbatim or modified, providing that you comply with the terms of the CC-BY-SA.